What? You thought burgers, tacos and donuts had the drive-thru market cornered? Oh no. They can’t compete with kegs, cigarettes and wine coolers. Not in the South anyway. 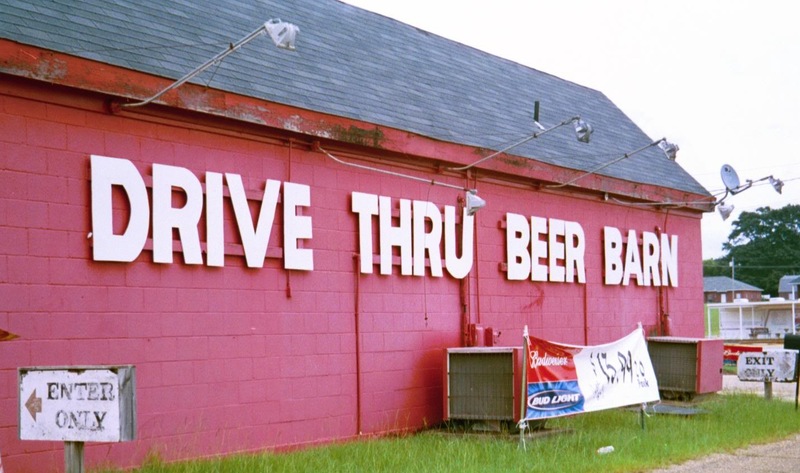 I can’t say how the drive-thru beer barn got started, but I suspect it was the brainchild of someone whose six-year-old flat out refused to go into the tote-sum for momma’s Marlboro Lights. See, if I was making a list of Stuff Southern People DON’T Like, number four would be “Getting Out of the Car” (or more likely, the truck). A beer barn isn’t necessarily in an actual barn, but “beer building” just doesn’t sound festive at all. The cool thing about beer barns is that minors are allowed in. Craving a bag of pork rinds and a coke? Need a pack of gum? M & Ms? Just drive on through! 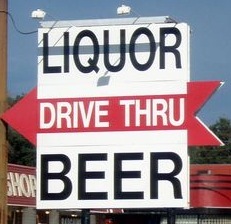 You might think the idea of a drive-thru alcohol purveyor is counterintuitive. Wouldn’t this promote drinking and driving? That’s like saying drive-thru restaurants promote eating and driving. Who wants to eat in the car when there’s a big screen TV and a coffee table waiting at home? I reckon beer barns might have been outlawed by some zealous Baptists, seeing as the one on Lakeland Drive was closed eons ago. Now, that, my friends is counterintuitive, seeing as Baptists are the ideal demographic for the drive-thru beer barn: no chance of being spotted in public toting a six-pack of Bud. When I was in high school, Mississippi changed the drinking age to 21, but Louisiana had yet to jump on the bandwagon. Folks would drive across the river at Vicksburg to this place called Daiquiri World where you could get a ginormous Styrofoam cup of daiquiri TO GO. There might have even been a drive thru. And what’s better than a drive through beer barn? A drive-thru LIQUOR joint. Beats the heck out of the drive-thru espresso stands that multiply faster than rabbits – or Starbucks – around here. Ever been to a beer barn? Do they still exist? If you think I’m talking about the band, you most likely didn’t attend a Southern university. Everclear grain alcohol is particularly popular among college students and anyone else who wants to get really drunk, really fast, for really cheap. While it’s not completely odorless and tasteless, Everclear tends to go unnoticed when blended with fruity mixers like Hawaiian Punch. But after a couple of Jello shots or plastic cups full of “Whoop Juice,” you will know it was there. Boy, howdy. If you wanted to get crafty, I reckon you could make your own, but it just wouldn’t be the same. Probably best to leave it alone anyhow. Otherwise, you might drink too much, end up with a purple moustache, and be saddled with the unfortunate nickname “Pierre.” Hypothetically speaking, of course. Do you drink Everclear? If so, why? And what with?